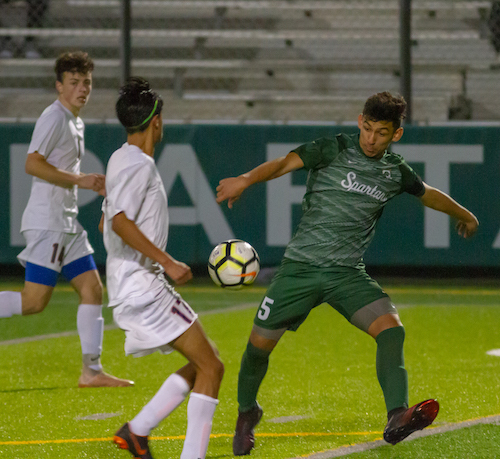 Legendary coach John Wooden described success as “peace of mind, which is a direct result of the self-satisfaction in knowing you did your best to become the best you are capable of becoming.” The De La Salle High-Concord soccer team simply knows it as tradition. With seven North Coast Section championships in the last 10 seasons, the Spartans hold themselves to a higher standard. The continuous expectation to be greater than the team before comes with having the iconic Spartan shield across their chest. On the sideline, assistant coach Mario Selva is a constant reminder that what they’re chasing is never too far off. Selva, a DLS alumnus was a member of the 1996 Hall of Fame team — the only team in school history to go undefeated. Everything this team embodies is motivated by is fueled by tradition. Even its pre-game ritual — dubbed “lights out” — featuring a dark room broken into segments of complete silence for reflection and the other for music and motivational speeches, has been passed down from Spartans before. Another tradition the soccer program keeps alive each year is writing its goals and expectations on the team room white board, ensuring the objective is clear and concise. Atop the list this year was getting the new guys up to speed, followed by repeating as NCS champions. 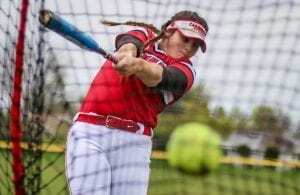 The new addition to the list is to win their first CIF Northern California regional title. 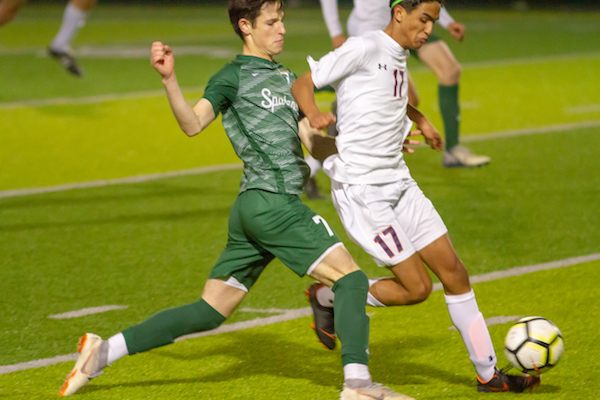 Spartans sophomore Juanpablo Hernandez fights for a ball against Dublin. The 2017-18 season marked the first CIF regional tournament. 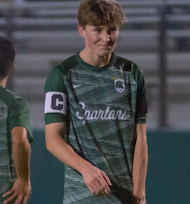 After winning the section title, the Spartans earned a top seed but were bounced out in the quarterfinals in a 2-1 home loss to Burlingame. Their 9-1-2 mid-season record may not show it, but the young team faced early growing pains along and a larger-than-normal learning curve. 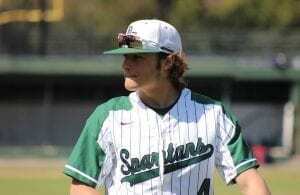 With a roster that holds a combination of nine freshman and sophomores, the Spartans boast their youngest team to date. Co-captains, senior Dillon Morley and junior Ben Parker have focused heavily on getting each teammate on the same page. The pair have focused on building the brotherhood and camaraderie that has been the building blocks for success in years prior. 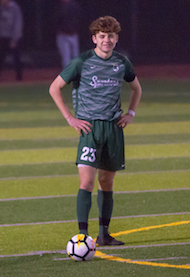 Dillon Morley smiles as he prepares for a penalty kick during a 6-0 win over Dublin. Getting a newly-assembled team on the right track takes time. Sometimes it takes a little friction to reach the proper level of teamwork. Parker and Morley both believe that this year’s team to have a chance at a deep run, each player must have leadership tendencies in their game. Equal trust among each one is what any successful team must have. However, the coaching staff and captains know that great expectations and a storied past comes with a target on their back. Shut-down defense has become the Spartans’ best way to combat teams looking to catch them off guard. With six shutouts and only eight total goals allowed through the team’s first 12 games, it has become clear why this team prides itself on a bend-but-don’t-break style of defense. Coming out aggressive — letting opponents know there won’t be any easy goals — has become a calling card for these Spartans. It’s a task both captains look forward to week in and week out. The Spartans faced some early season adversity when they failed to hold on to a win against state power Cathedral High-Los Angeles. 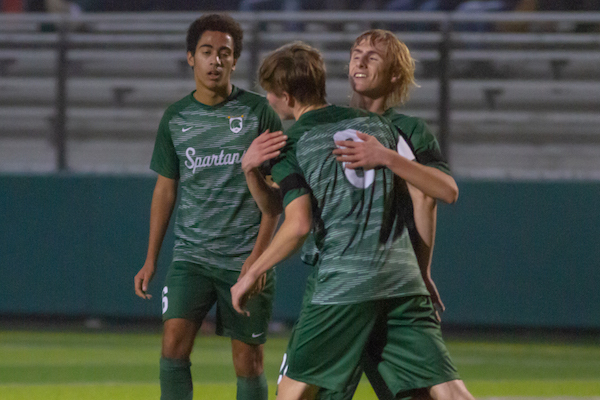 After leading early, the Spartans fell 2-1 in the neutral-site tournament game. Losing to a highly ranked team may not seem like a season dark spot. But the missed opportunity forced the coaching staff to seek a recommitment of focus. “We either do this, or not,” Brown pleaded. It was a turning point. The Spartans followed up the loss with a 5-1 no-doubt win over Ridgeview-Bakersfield in their next match. 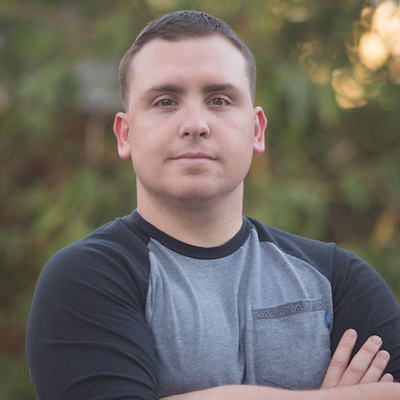 Overcoming adversity and rough patches isn’t something that happens by accident. It starts at the top and works its way down. The coaching staff’s guiding principals for the team starting with the blueprint De La Salle developed as an institution. With the amount of support and trust his players show, it’s clear they embrace his philosophy for winning. That motivation right there is likely the fastest ticket to this team’s spot within the De La Salle soccer legacy. How can I order paper copies of this magazine? Unfortunately, our January issue was an online-only edition. You can email me at editor@sportstarsmag.com and we can try and get you some high-res PDFs of the article.